Every other Sunday, services at the Unitarian Church of Montpelier include an opportunity for individuals to come forward and light candles of joy and/or concern. I am usually shy about speaking in front of the congregation, but on the first Sunday of 2012, I was moved to light a candle of concern for what I suspected would be a tumultuous year ahead. I spoke of a desire to face such turmoil with a loving heart. 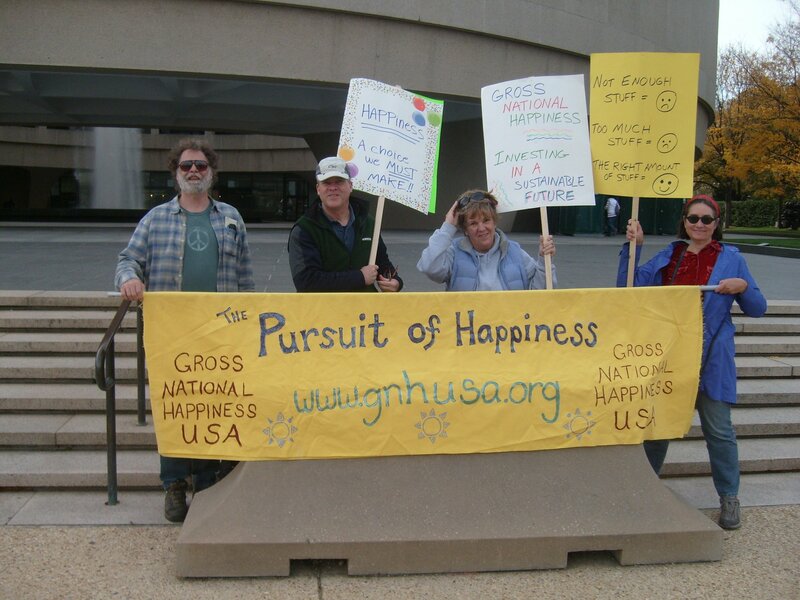 Spreading the happiness message at the 2010 Jon Stewart rally in D.C. The article — “Happiness is a Global Tax” — is on the Accuracy in Media website. When I first read it, I felt a cold sense of dread reading my own words (taken from the Online Store page of this blog) being somehow used as a weapon against me and my colleagues coast-to-coast working to advance the gross national happiness concept. Seriously? Seriously! Now that is funny. But back to that love thing … When I had more time to reflect on the article, I knew I wanted to react with love and compassion. I know nothing about the author, but it isn’t hard to feel compassion for her. After all, what are the wounds and struggles that would cause someone to approach happiness with such fear? I’ll likely never know, and even asking the question seems a tad presumptuous — but it does allow me to think of her with love, and that makes me happier than hanging on to anger, hate, or fear. For some reason, this incident made me recall my lack of compassion during another era when I acted against a dominant paradigm. I was in the ninth grade, a normal 14 year-old girl (read, “boy crazy”), except for my home life. My family were liberal Democrats, and fairly open-minded on issues like race. So when I got a romantic phone call from a black football player, I was simply thrilled (A boy!! Calling me!!). Race didn’t matter at all. Little did I know that our relationship would lead to public anger and approbation in my very conservative, overwhelmingly white school because the reigning paradigm did not condone inter-racial dating. The worst disapproval came from two of my closest friends, Debbie and Cindy, each of whom told me that her parents forbid her to have anything more to do with me. And for that, Debbie and Cindy suffered. We were in the same section together — that is, we shared all our classes. For a variety of reasons, the section coalesced around me. Debbie and Cindy became the outcasts. I don’t remember wanting to hurt either of them, but I did want and need the support of the rest of my classmates and friends. I’m sure I gave little thought to their pain. Today, I think of the 14 year-old Debbie and Cindy with compassion. And I hope to hold my more mature self to a much higher standard of love and compassion than my adolescent self was capable of. The Accuracy in Media article also brought to mind a video I watch frequently after meditating: a beautiful and moving rendering of the St Francis of Assisi prayer by Sarah MacLachlan. In particular, the request in this song to “seek not so much to be understood as to understand” resonates today. Indeed, I hope the happiness paradigm will someday be accepted as self-evident. Until then … well, here’s to understanding, love, and compassion! Happiness Is A New Baby! Thank you Ulrike! Your support is very important to me! all and be happy…it is good for your health and the world. Thanks for the clarification on the quote.